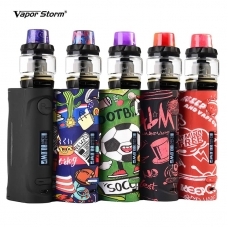 Vapor Storm newly launched Puma Baby Kit with Hawk Tank. It is an elegant starter kit consisting of a Puma Baby Mod and a Hawk Tank. The mod comes with personalized graffiti series design, offering you visual feast. The quality ABS plastic material and light weight will give you ultra great hand-feel. Powered by single 18650 battery, the mod could achieve 10s continuous vape time and fire up to 80W max output. Plus 0.91 inch display and multiple protections, the mod will not let you down. The tank features exquisite design of big glass. The 6ml capacity liquid will bring you the longest vaping experience. Available in Black, Football, Vape on White, Vape on Black, Freedom.